It is my pleasure to announce that Martin Boyd, owner-operator of Diálogos Intercultural Services, has recently published my review of The Story of Spanish, a book co-written by Canadian authors Jean-Benoît Nadeau and Julie Barlow. Below is an excerpt of the text. According to 2012 statistics prepared by the Cervantes Institute, Spanish is the native language of some 500,000,000 people. It has official status in 21 countries, and 18,000,000 people worldwide are learning Spanish as a foreign language. Indeed, Spanish is now the world’s second or third most widely spoken language. With such compelling statistics, one might ask: How did Spanish become so important in the world today? Why are so many people learning it? Answers to these questions, and many others, can be found in The Story of Spanish. 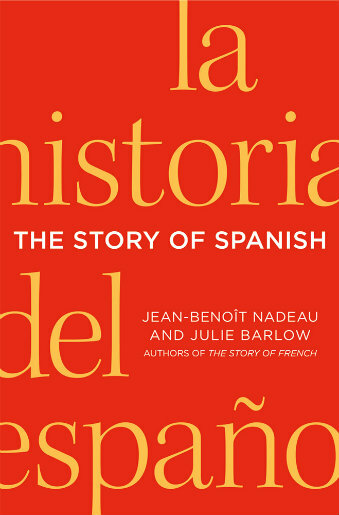 Like The Story of French, published in 2008, The Story of Spanish is the brainchild of Canadian authors Jean-Benoît Nadeau and Julie Barlow. In the first few pages of the book, we learn how both authors developed an interest in the Spanish language. Their stories begin in the 1980s, when they became intrigued by the role of politics in Latin American society; the spread of telenovelas, or Spanish-language soap operas, into households in Europe, the Middle East, and southern Asia; and the use of Spanish among Mexican peasants whose mother tongue was Nahuatl. These observations encouraged the couple to learn Spanish and explore its evolution. Los lectores hispanohablantes pueden leer la versión española de la reseña del libro aquí. ¡Buena lectura a tod@s! Thank-you, Martin, for posting this review on your website!